The consumption of products (including their production, transport and distribution), represents nearly 50% of emissions contributing to climate change. If not transferred into reuse schemes, these products will eventually become waste that needs to be managed. · Dematerialisation: Doing more with less! · Using less material directly results in less waste being produced and a higher resource efficiency. Replacing products with services, sharing and borrowing products, and the organisation of group services instead of individual ownerships is one aspect of dematerialisation. In everyday life this could involve you renting tools from your neighbour or colleague, being part in a car sharing network instead of owning a car, listening to music via digital music distribution systems instead of buying CDs, etc. Another aspect of dematerialisation is the absolute or relative reduction in the quantity of materials required to satisfy needs in society. That would include increasing the efficiency of material use (using less materials for a specific function) and substituting materials (exchanging heavy materials with light materials), but also reusing products. 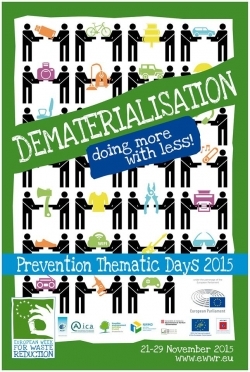 In 2015, the Prevention Thematic Days will focus on how to do more with less. To highlight this topic and to encourage and support EWWR Action Developers to implement actions around this issue, a number of tools will be developed.